Atletico Madrid have on Tuesday, April 2, the opportunity of revenge against the Girona, responsible for its elimination in the Glass of the King. The confrontation, this time, is valid for the Spanish Championship. It is part of the schedule of the thirtieth round of the 2018/2019 edition of the tournament. It will be held at the Wanda Metropolitano stadium, in the capital, starting at 2:30 p.m. (Brasília time). 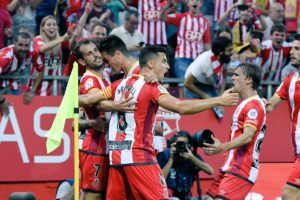 Atlético fell in the King’s Cup against Girona without losing. The home side took a 1 – 1 lead. It was a 3-0 home triumph at the stadium and was out of the competition due to the qualifying goal. It was only the first embarrassment that carried out the season with the elimination before a team that, then, fought against the relegation in the Spanish Championship.The biggest was yet to come. It happened in the Champions League. After scoring 2-0 at home in Juventus, he took 3-0 in Turin. In this case, not so much the turn was shameful, since the team of Turin is an adversary of respect. But the way this happened. Atletico spent the entire game without hitting a goal in the goal of the Italians.Thus, the team reaches the final stretch of the season in a melancholy way with the only real goal to be achieved is the search for the runner-up. On Saturday, March 30, he took a step in that direction by thrashing out Alaves 4-0 to reach 59 points (17 wins, 8 draws and 4 losses). He remained ahead of two points in the comparison with Real Madrid, third place. Barcelona, leader, has ten more.As principal, Atletico have chances to take the lead in the LaLiga ranking. Of the 42 points he played at Wanda Metropolitano, he won 35 (11 wins, two draws and one loss), scoring 23 goals and suffering seven. Barcelona earned 36 points in their stadium, but doing one more game.The coach Diego Simeone has some medical doubts to scale his team. Defensive players Santiago Arias (19 matches in the 2018/2019 version of the Spanish League, one goal) and Lucas (14 matches, one goal) are in the process of injury recovery; midfielder Thomas Lemar (25 games, two goals); and attackers Diego Costa (15 games, two goals) and Borja Moreno (one game, one goal). Girona won a longer period for recovery aimed at meeting this Tuesday. His commitment for the twenty-ninth round of the Spanish Championship was scheduled for Friday, March 29. At home, took 2 to 1 of Athletic Bilbao.Staying in the 34 points (eight wins, ten draws and 11 losses), he ranks thirteenth on the leaderboard. It has six points ahead in comparison with Celta, eighteenth placed and first team in the relegation zone.Its performance as a visitor, however, is far superior. In this respect, the Girona show the standard of performance of the team that fights for a place in the Champions League. It is the fourth best of the Spanish Championship. Of the 42 points he played in column two, he returned home with 22 (six wins, four draws and four losses) having scored 18 goals and suffered 16.To face Atletico Madrid, goalkeeper Bono (25 performances in the 2018/2019 version of the Spanish league), injured, should be left out. Midfielders Aday (nine games, no goal) and Douglas Luiz (17 games, no goal) are also in the care of the medical department. 1. 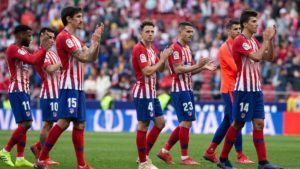 Statistical data to be taken into consideration before playing Atletico Madrid vs Girona betting tips! The failure suffered two rounds on Bilbao’s field down the Real to 4 points. The fight for the title is also theoretically concluded, Barcelona has 10 lead lengths, in these conditions the second place remains the only goal. Real Madrid is the only team to triumph this season on “Wanda Metropolitano”, 1-3 was the final score. 11 wins and two draws are the other results recorded against their supporters. He makes a good season, after 29 rounds is 13th with 34 points, still retains the chance to catch the Europa League. He comes after a 2-1 home defeat in the company of Bilbao. There are big problems in the offensive compartment, with only 32 goals scored by two bands being worse in this chapter. He spends a very good time in the form where he has 3 consecutive victories with Real Madrid, Rayo Vallecano and Leganes. 2. Latest information before Atletico Madrid vs Girona! Diego Simeone has great defensive problems where Lucas Hernandez, Stefan Savic and Santiago Arias will be missing. Filipe Luis is recovered after a muscle problem and occupies the left side of the defense. Vitolo and Borja Graces are still in convalescence. Johan Mijica will be absent because of an injury, Aday and Douglas Luiz remain outside the group for the same reasons. 3. Atletico Madrid vs Girona teams probable! Atletico Madrid: Cloud – Juanfran, Gimenez, Godin, Filipe Luis – Griezmann, Thomas, Koke, Saul – Morata, Costa. Girona: Iraizoz – Ramalho, Alcala, Juanpe, Raul Garcia – Muniesa, Portu, Granell, Pere Pons – Borja, Stuani. 5. Atletico Madrid vs Girona Latest Last Date Info! Five times the two bands have met so far, all parties ending in a tie. With exclusive dedication to the Spanish Championship and acting in their domains, Atletico Madrid, even in front of a visitor with excellent use as the Girona, makes the prognosis in their success is the best guessing option for the meeting that opens on Tuesday the competition of the thirtieth round of the Spanish Championship 2018/2019. I’m looking forward to the success of the hosts, who are a rewarding team in front of their supporters. Atletico has a very difficult match in Barcelona next week at the New Camp, which does not make him sure he will win in that duel. Under these circumstances, the points played against Girona become vital if he wants to finish the season second. The Madriens’ offensive looks very good on paper with Alvaro Morata and Diego Costa backed by Antoine Griezmann.